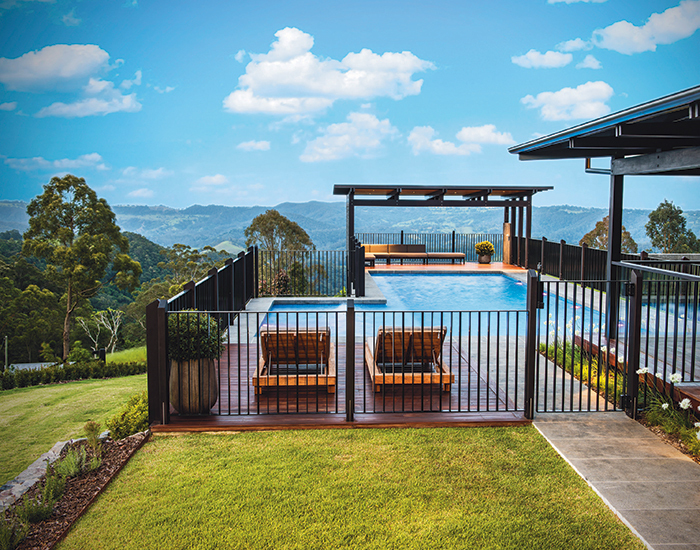 The sweeping mountain backdrop framing this Maleny hinterland home, which overlooks picturesque Sunshine Coast, warranted an idyllic outdoor entertaining area that the owners could relax in and enjoy magnificent views year round. 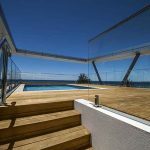 So that the new outdoor area would integrate seamlessly with their beautiful home, the owners opted for a minimalist look with a touch of luxury – a timeless and classic yet contemporary style that wasn’t going to date. As the home was built on an acreage block, space wasn’t an issue – but the slope of the block posed a challenge. Award-winning builders, Beau Corp Aquatics & Construction, addressed the issue by installing extensive retaining walls and creating a flat, grassy area to maximise the outdoor space. The dramatic drop at the rear of the block required core filled concrete block work to encase the entire area. The idyllic outdoor entertaining area comprises a 14m x 6m swimming pool, with an entertaining pavilion at both ends. The fully automated, 2.2m deep swimming pool features a commercial-grade Astral pool heater to enable swimming no matter what season. 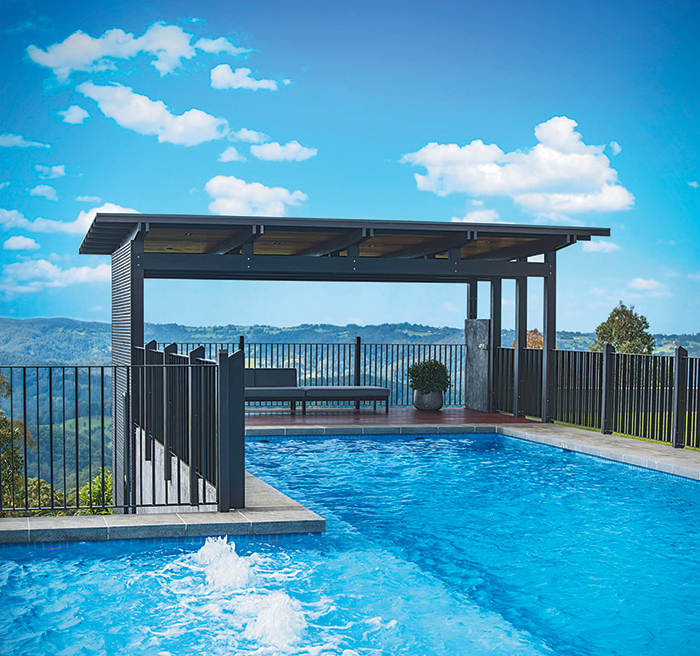 Venturi swim jets are installed in the pool’s wide bench seats, where the family can sit to enjoy stunning vistas out across the hinterland. 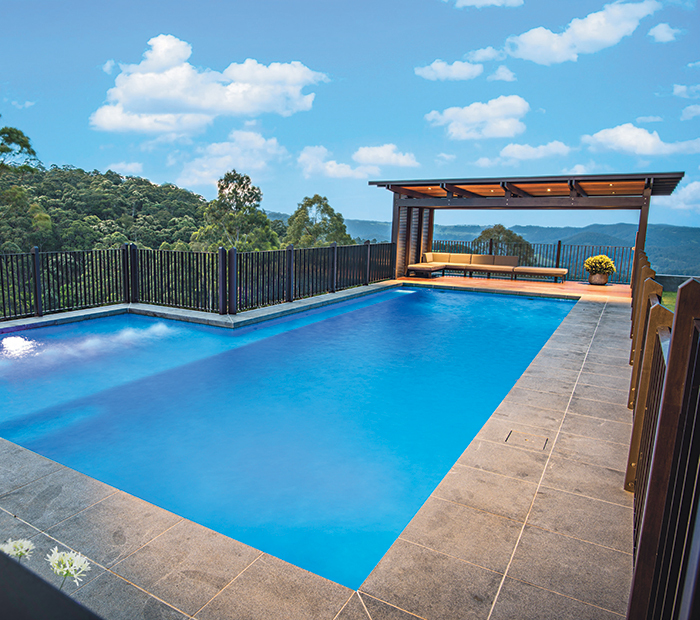 Seamless straight lines keep the look geometrical and minimalist, while Bluestone pavers and coping give the pool perimeter an elegant and eye-catching finish – the dark toned natural stone integrating beautifully with the home. Soft native plants and Agapanthas furnish the garden areas, while beautiful aesthetics abound in the diverse textures, timbers, concrete and exposed brick used throughout the outdoor pavilions. Pacific Jarrah and PNG Rose Wood has been combined around the exposed brick fireplace in one of the outdoor pavilions for stunning effect. 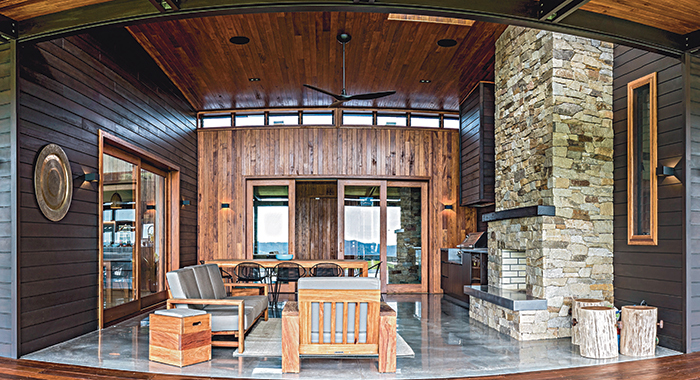 Inside, each of the pavilions features gorgeous Merbah timber. Durable, designer matte black metal fencing has been used to partition the outdoor area and looks stunning against the home. Aside from obvious visual appeal, environmental considerations were prominent in the selection of materials and installations. 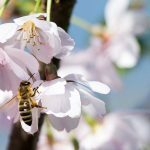 Water and energy efficiency options have been used, such as water tanks, a Sunlover pool blanket, underwater LED lighting, and heating and filtration systems. It’s another triumph in stylish and sustainable design from Beau Corp Aquatics & Construction. 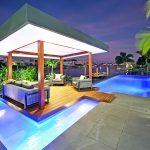 Start planning your pool project now with our directory of South East Queensland experts.